Hi there and thank you for visiting. We are extremely excited to get the story of Gideon out there as a book. We believe it is meant for such a time as this. The world is desperate for God’s Kingdom message of love and restoration back to HIM and to remember the color of a man’s skin has nothing to do with the spiritual ties that bind us all as brothers and sisters thru Christ Jesus. Father God longs to gather us in for an eternal group hug if we would just open our hearts and arms to Him and one another. To purchase as a Hardcover, Softcover, or Kindle please click the link below. Thank you ALL so much for your support and please share with family and friends. We truly believe this story is one that will touch the lives of many and our sincere prayer that it will be for the healing of this awesome nation we are blessed to live in. Gideon T-Shirts, Coffee Mugs, Cell Phone Skins. And more to come. This weekend we are studying the PROOF of the manuscript and my brother Joseph Wraith is finalizing the COVER….So by the beginning of the week we expect to give the green light to Xulon Press to proceed with the Final Typesetting and subsequent Publishing of our dream. We will continue to update as it goes. GOD Bless!!! We are pleased to announce Gideon the Novel is being published by Xulon Press and will be available to order through this webpage. It will also be available through the Xulon Gideon Page, Amazon, Barnes and Noble, and numerous outlets. However, if anyone orders it directly from us, we will be pleased to send you out a SIGNED EDITION (Hard Copy). 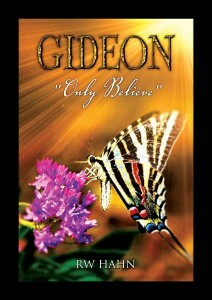 Also available will be Gideon the EBOOK for all tablets and E readers. Thank you for your support as we look forward to what GOD is doing with this beautiful story of forgiveness, redemption, and love. We would love for you to visit our Facebook page, like it, and share it with your friends. Together we can take the loving message of GOD reaching down and touching a town divided by race in a miraculous way to our nation, and even the world. This is the book cover designed by my awesome and mega-talented brother, Joseph Wraith. May the whole world see your talent as I do my brother! Thank you for this and GOD Bless. She was moved to tears many times and wrote to me to tell me she often had to stop, put the book down, and pray or reflect, or collect herself because of the overwhelming emotion she was experiencing while reading. For me this is not only a validation of what I believe GOD has asked me to do, but raises my hopes that this story will indeed resonate with its readers. This is Lee Ann’s Review. This is indeed an exciting time for Alan Yott and me, as we have never lost sight of the dream and vision GOD has charged us with regarding GIDEON, both the Movie and now the Book over these past ten years. 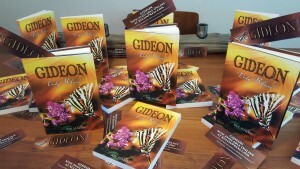 We truly look forward with anticipation that sometime this year, GIDEON the NOVEL will be published and we will be able to physically hold the dream in our hands with all thanks and humility for what the LORD has done. GOD Bless and let our journey encourage you to never give up, but trust JESUS in all you do, striving to get to know HIM and the FATHER, for as HE said, that “is eternal life”, and HE will bring all that HE has promised you to pass. Thank you all for your interest as we look forward to Great things!!! !